GTN and Aires – Tax Reform: Now What? 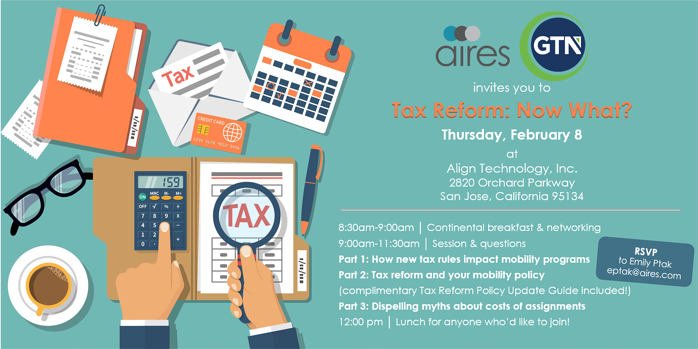 GTN and Aires are teaming up to provide a thought provoking session on the new tax reform, and how it directly affects your global mobility program. The event will be held on February 8, 2018 at Align Technology, Inc. in San Jose, CA. By attending this half-day event, you will walk away with tactical resources to help you navigate the impacts to your mobility program and policies. This will also be a great forum for you to exchange ideas with other mobility program managers. To register for this event, please contact me at jchung@gtn.com or at +1.408.606.4827. 12:00pm | Lunch for anyone who’d like to join! Brett has more than 20 years of experience in international tax services. He joined GTN in 2006 and serves as Managing Director for GTN's Pacific region. He is responsible for providing tax compliance and consulting to international assignees and their employers. Julie has over 15 years of experience providing expatriate tax advice to organizations of various sizes as they move employees around the world. She joined GTN in 2016 and serves as a Director for GTN's Pacific region in Southern California. As a 34-year relocation industry veteran, business writer and speaker, Eric brings depth of knowledge based on his experience, research and interviews with industry leaders. His accreditations include a Senior Certified Relocation Professional SCRP (which is held by less than 200 people in the world) and his Senior Global Mobility Specialist SGMS accreditation. Emily joined Aires in 2011. In her role, she works to find solutions to meet client needs through collaboration, partnership, and understanding their culture. Her strategic and knowledgeable consultative approach helps clients meet their mobility needs. She fosters strong relationships with her client/prospect base and seeks to help them in the strategic development of their programs. To register for this event, please contact me at jchung@gtn.com or at +1.408.606.4827. I hope to see you there! For more about GTN, visit gtn.com. Julie has over 15 years experience providing expatriate tax advice to organizations of various sizes as they move employees around the world. She joined GTN in 2016 and serves as a Director for the GTN Pacific region in Southern California. She has extensive experience in advising on matters such as home and host country tax filing requirements, permanent establishment risks, global compensation reporting, cross border tax compliance & consulting, international payroll, shadow payroll, social security, compensation, stock-based incentive plans, policy development/design/advice, program structuring, rotators program, trailing tax liability management, cost projection, accounting for assignment costs, cost management, information reporting, tax treaty issues etc. She earned her Masters of Accounting from University of Waterloo in Waterloo, Ontario, Canada, has a Bachelor of Business Administration, Accounting from Wilfrid Laurier University and is a California CPA. Away from work, Julie enjoys traveling, discovering new restaurants and spending time with her family.